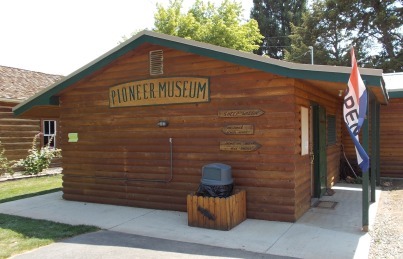 The Tensleep Pioneer Musuem is a small musuem featuring the history of Tensleep Wyoming. 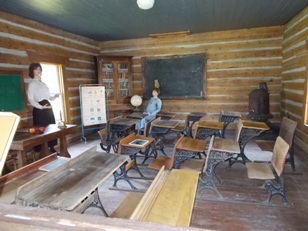 It has displays of local fossils, the Spring Creek Raid, Big Trails School, and life and history of the Pioneers who settled here. A few of the exhibits are shown here but there is more to see at the museum. Ann Williams Bader was born in Avonshire, Wales in 1841. She married Benjamin L. Bader in 1859. Benjamin was a member of the Wisconsin, Volunteer Army and fought in the Civil War. He was discharged from the army on December 27, 1863 in rather poor health, having been captured and spent time in a southern prison. Ann and Ben had a family of 10 children, 7 boys and 3 girls, one who died at birth and one who was accidentally shot and killed. Ben Bader Sr. took his family except for the 2 girls, who stayed with relatives, from Wisconsin to Nebraska. Ben died in 1886 and buried at O'Neal, Nebraska. 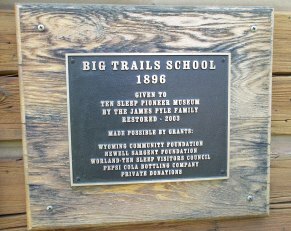 In 1895 Ann and 3 of her boys left Nebraska in a covered wagon headed for Lost Cabin, Wyoming where a cousin, Charlie Bader lived. Ben, Fred and ARch had already made their way to Lost Cabin. 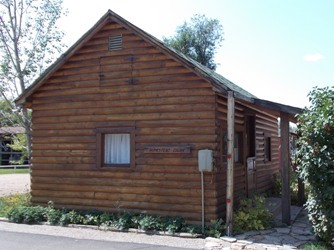 In 1896 Ann and her boys made their way over north over Cottonwood Pass and the Upper No Wood Country to the Lower No Wood where Ann took up a homestead. Ann's son Fred Bader married a young school teacher, Ethel Daugherty, who had recently come to Wyoming with her family by train. They were married March 28, 1905 and to this union were born 7 children, Vivian, Bert, Fred L. Jr., Faye, who drown in the No Wood River at 2 years of age, Paris, Beatrice, and Maurine. Fred and Ann's lives were spent on the Lower and Upper No Wood except for a few years when they lived in Ten Sleep. Fred died in 1950 at the age 80 and Ethel in 1969 at the age of 89.